A lot of what I do over here is exorcise demons. What may look to you like an unassembled Weber grill is, to me, rewriting history. My family had enough money for a Weber grill. Let’s face it, even if you couldn’t afford a stove, you could afford a Weber. But I didn’t have the kind of childhood where my parents could stand each other enough long enough to plan the barbecue, so it never happened. In college I had a baby Weber but somehow it just wasn’t the same. 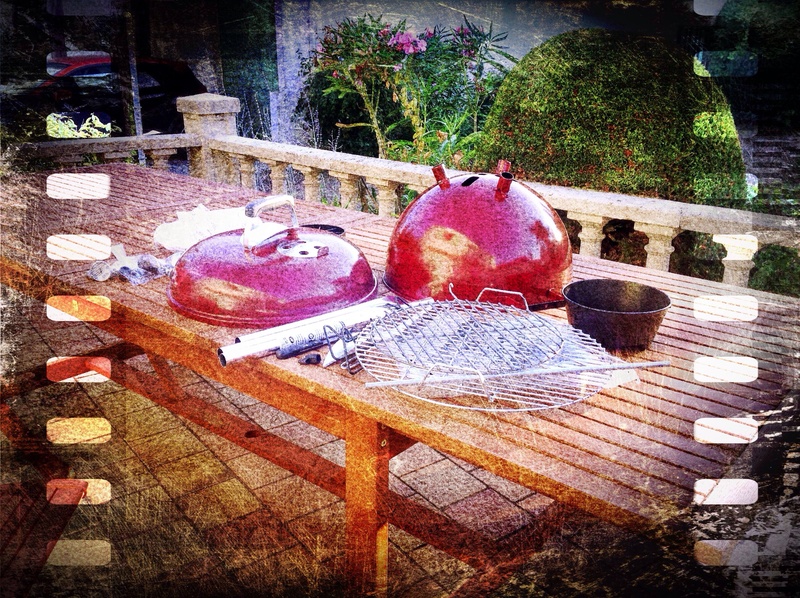 Now, here in France, I have a full-on Weber grill, bought at the local garden store no less. I will assemble it. I will cook one thing on it. I will be happy. One more demon, gone. That’s all it takes. We will look forward to the descriptions of the wonderful meals prepared al fresco on the weber! Thanks, Gerard. Now I have to get that thing put together. Last week it was raining. Today it’s sunny and 32, which I think is in the 90s, and I’m thanking the stars I didn’t buy in the south of France, where I hear the temperature will hit 40. The grill and the deli will be seeing a lot of action. When you guys get done, come over here! I could use some help. My terrace shadecloth has completely rotted. I am afraid to open the awning. The way I am going, I’ll probably get around to replacing it just before I sell the house. No worries. The big house, the one under construction, that’s a keeper. But seriously, you didn’t think I was living there, did you? I see a new post coming on, one that will show the floor all ripped up. The place where I actually live is habitable. Patio — oh, excuse me, terrace, now that I’m in France — Weber, working kitchen and bathrooms, furniture: really it’s all set up. The thing is, I get bored with “all set up.” So I don’t know, maybe I’ll keep it as a rental. I haven’t really decided.